Stoneware. The Lastra Fish Canape Plate features the sophisticated lines of Lastra with the charming details of a fish. A perfect luncheon plate! 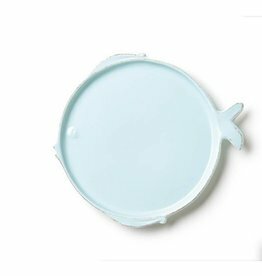 Pair the Lastra Fish salad plate with white Lastra for a clean look or with Marina Blu or Fantasia Yellow for a pop of color. Handmade in Tuscany of Italian stoneware. Microwave, oven, freezer and dishwasher safe. You'll love the clean, simple lines of this collection and this ample mug with its fun and surprising shape is no exception. Handmade in Tuscany of Italian stoneware. Microwave, oven, freezer and dishwasher safe.